Location The link Locations / Maps will show you where these places are located. Pailton is a small town in Warwickshire about 5 miles NW of Rugby. North and a little to the east from Pailton about 4 miles is Smockington Hollow, a land depression across which the A5 motorway passes. This was formerly a Roman road for hundreds of years and is also known as Watling Street. This land depression named Smockington Hollow appears on maps with a stream running at the bottom and continues towards Pailton. Smockington Hollow is where my Gt Gt Grandparents John and Mary MUSTON (nee Stanton) lived and raised their family from the early 1840’s until the 1880’s. The maps show Smockington Farm, Smockington House and Smockington Lane. The A5 was widened to 4 lanes in the late 1990’s and the then derilict houses in Smockington area may no longer exist. I am not sure if the family ever lived at Pailton. They may have had other family connections there, or it may have been the central place for recording births which at the time would have almost certainly occurred at home. The Warwickshire and Leicestershire areas were heavily populated with Mustons. About one mile from Pailton is the Monks Kirby Church. This Church is where most of the Mustons I decend from were christened or married. 1 ½ miles SW of Pailton is the Stretton under Fosse church where Mustons of generation 1 below were christened. In Rugby another large family of Mustons registered family activities at various churches. Being so close it seems that these families were part of the same larger family. This Rugby family also has a large number of decendants in Australia. The Rugby family decendants originally settled in the Gippsland region of Victoria (Australia) where my Gt GF also settled which makes me curious as to whether they knew each other. William MUSTON married a Mary in approx 1805.They had at least two children, a daughter Mary who was christened on the 31 of Dec 1807 at Stretton under Fosse, and a son John who was born 13 Jan 1813 and also christened at Stretton under Fosse, on 4th May 1817. A Thomas MUSTON married Mary Elkington in Oct 1803. Thomas and Mary had at least 3 children, William b1805, Thomas b 1809, and Sarah b 1812. These children were also all christened at Stretton under Fosse. It will be interesting to find the links between these families but at present we can only guess that Thomas and our William were brothers. This is just inserted to give information of the extended MUSTON family in the area at that time. John Muston (b 1813) married a Mary Stanton (b 1822) in approximately 1841 in Claybrooke, Leicestershire, the town where Mary was born, which is about 5 miles from Pailton and 2 or 3 miles SE of Smockington. In the 1851 and 1881 census John and Mary Muston were listed at (address) Smockington Hollow, (Census place) Monks Kirby, (Parish name?) Lutterworth. Given that these 3 locations were all listed as being part of the one census address it is unclear if they were all born at the same location or not. The area has many canals and was an agricultural region. John Muston (sr) was listed as an Agricultural labourer so may have had to travel to various farms to work. i. HANNAH2 STANTON, b. 14 Jun 1820, Thornton Leicestershire England. ii. MARY STANTON, b. 23 Jan 1822, Claybrook Leicestershire England. iii. ELIZABETH STANTON, b. 11 Jul 1824, Claybrook Leicestershire England. iv. COMFORT STANTON, b. 19 Feb 1826, Claybrook Leicestershire England; d. 29 Dec 1895, Bunbury Western Australia; m. (1) JAMES BLYTHE, 19 Mar 1843, Bunbury Western Australia; b. 1811, Dundee Tayside Scotland; d. 1857, Guildford Western Australia; m. (2) JAMES HAYES, 1860, Bunbury Western Australia; b. 1826, England. v. ANN STANTON, b. 11 Jan 1829, Claybrook Leicestershire England; d. 14 Jul 1891, Perth Western Australia. vi. ESTHER STANTON, b. 1830, Claybrook Leicestershire England; m. THOMAS ENGLISH; b. 1820, England. Given that Mary's younger sister Comfort Stanton married in 1843 in Westerna Australia, it is clear that her parents migrated to Australia and left her to fend for herself in England before she was 20 years old. If you look at the Stanton page you will see a note about Mary Cave dying in 1840 but not saying where. Joseph died in 1844 at Australind WA (a word made from Australia and India) which was a land development that began in about 1840. The first settlers arrived in 1841 and by the following year over 440 immigrants had settled in the area. The plan was to divide a huge land grant of over 40,000 hectares into small farming lots of 40 hectares and establish an English style village in the centre of this project. The settlement was short-lived and had been abandoned by 1843 so this may be why Joseph ended his days here. There was also a penal settlement nearby so maybe he worked there. It is also interesting that her son John, my Gt Gt Grandfather also migrated to Australia. Johns grandfather Joseph Stanton had died in Western Australia (see above) before he was born so John may have arrived in Australia via the West Coast and initially stayed with his Grandmother (if she was not already dead), or at least his cousins who were by then well establised in WA. I have not yet traced his date or port of arrival. Just a theory as to why he might have chosen Australia. The Stanton name was carried down in the Canadian family of Mustons. John MUSTON and Mary STANTON's first child Mary (b 1843) is listed as being born at Lutterworth, with Ann (b 1844), John, my Gt GF (b 1849) and Joseph (b 1851 being just 2 months old) are listed as being born at Pailton in the 1851 census. John and Mary later had two other children, James b 1854 and Walter b 1863, all christened at Monks Kirby. In the 1881 Census John and Mary live alone at the same address in Smockington Hollow. What happended to them afterwards we do not know at this time. 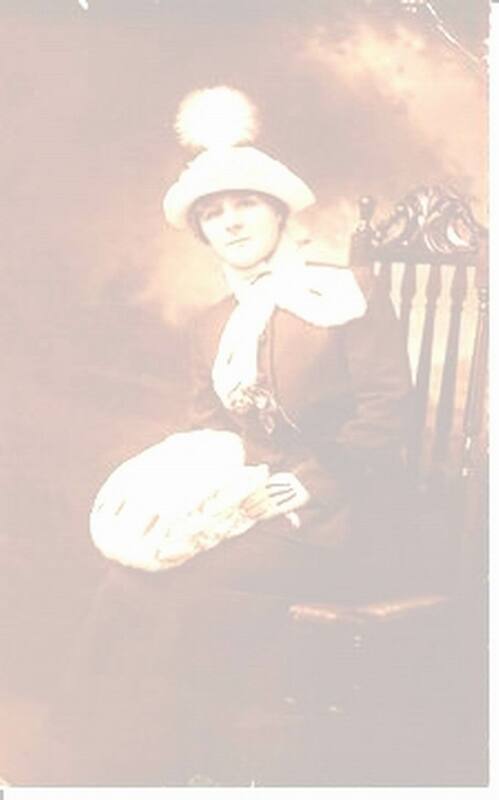 I do have a photograph that may be Mary MUSTON (nee Stanton) but this is not confirmed. Mary and Ann married in a double wedding on 7th Nov 1865, Mary to a Thomas Dunkley and Ann to a Thomas Hewins. The 1881 census list Mary Dunkley (nee Muston), now 39 and Thomas 43, as a Master Boot Maker with one employee living at Wood Market which is a street about 500 metres long in Lutterworth township. Lutterworth is about 5 miles from Smockington Holllow. They have a daughter with the recurring family name Ada aged 13 working as a general domestic servant, and a son Arthur aged 6. No further history of this family is available at present. Ann now 37 and Thomas Hewins 42, agricultural labourer, are living in Thurlaston, about 6 miles from Smockington Hollow with 3 children, Sarah 8, Ada 5 and Oliver 2 in the 1881 census. The name Oliver is interesting as 5 households away in the census (whatever that means) is Thomas Hewins aged 75, a widowed farm bailiff, living with 3 of his other grandchildren all with the surname Oliver. Tom (Thomas again) a stone quarry man aged 22, Sarah 20, and Annie 18. The girls occupation is not listed. It seems that this 75 year old Thomas would likely be the father-in-law of Ann Hewins (nee Muston). In the 1901 Thurlaston census Thomas and Ann Hewins lived at Croft Rd Thurlaston next to the Elephant and Castle Hotel with no children, and on the Thurlaston 1924 electoral role Ann (aged 80) and Thomas are still living at Croft Rd Thurlaston. The roll also lists Catherine and John Hewins, and the 1930 roll just John and Catherine. On the 1952 roll no Hewins family existed in Thurlaston. As yet I do not know who these other Hewins people were. The rolls only list people over the age of 21. Joseph is listed as being 2 months old in the 1851 census. I am not sure of the date the census was taken. 30 years later, in the 1881 census there is a Joseph Muston (born Pailton) listed as aged 27, living at 62 Oxford St, Swansea Town, Glamorgan, Wales, and married to Sarah A. Muston. At that time they have a daughter Ada aged one year. If Joseph is indeed 27 years old he would have been born in 1854. I think that he may not have known his age, or that maybe in the translation of writing this all down someone has made 1851 look like 1854. Either way the undisputable evidence that this is indeed the son of John and Mary (nee Stanton) Muston (my Gt Gt Gt G/parents ) is the scanned copy that Gillian Bauman of Pittsburgh sent to me of a list written by James MUSTON. This list was found in a photo album left by her aunt Olwen, her mothers sister, with the names and addresses of all of Josephs 3 brothers, Walter (in Toronto Canada), James ( his “country address” in Sussex) and John, my GGF (in Heyfield Victoria Australia). Also of interest is that his sisters Mary and Ann were not on the list. Gillians mother Ada and Aunt Olwen were born to Josephs son George and his wife Sarah (nee Williams) at the same Swansea Town in Wales. Olwen also has photos of Joseph with George and (I assume) James together. We now know from a newspaper clipping held by the Karen, granddaughter of Josephs brother John in Australia that Joseph died on April 4th1906 and is buried at Methyr Dovan in Wales. I now also have a scanned copy of his bereavement notice from A G Adams Undertaker that has printed on it Aged 50, but someone has crossed it out and written 55. It is unclear what happened to Josephs daughter Ada, or if they had any other children. James MUSTON is a bit of a mystery although it is unravelling slowly. In the note that Olwen left he has a “country address” of Tilgate Forest Lodge, Crawley, Sussex. Given that on the same piece of paper he gives his brother John's address as Heyfield, this note must have been written after 1895 when Alf was born in Goorambat. We know Esther was born in Heyfield in 1904 but not sure when they moved there. Gillian also has a card from a J. Muston who was a Wine and Spirit Merchant, his address was "Red Cow", Wooburn Green, Bucks. I overlooked this note from her until I went to visit Karen Berry whose grandfather Walter MUSTON was a brother to my grandfather George MUSTON. In her photo album prepared by her mother Frances Mary (Mayme) Martin (nee MUSTON) were some wonderful photos including a photo of the Wooburn Hotel with 3 men and 2 women standing out front. This pub is still in business today. When I scanned and zoomed in I could read the sign above the door as James Muston, proprietor. As the family obviously stayed in touch by letter, although the card was not written on, it is very likely that James would have visited Wales, most likely by train in those times. As a result of some information supplied in Jan 2008 we now know that James married one Martha Jane Fox in September 1881 in Coventry. It seems to me that if the above story about cousins meeting in a pub was in fact the Red Cow at Wooburn, then the likely story is that James held the license to that pub in 1919. Given that most Poms could not afford a motor car in those days and that James advertised 'good accomodation for cyclists' it indicates that cycling was trendy. The note about his "country address' being Tilgate Forest Lodge may indicate an ongoing relationship with that property, or that the note was written before he moved to London, but after 1895 and before 1901. Walter Muston (b 1863, 20 years after his older sister Mary) aged 18, was listed in the 1881 census as living in the Railway Station Refreshment Room at Rugby and working as a plateman, sharing his accomodation with 22 others. No wonder he went to live in Canada. (I assume a plateman was a dishwasher). My Grandfather George Muston (b 1893), son of John Muston (b 1849) had a letter dated 1919 from his cousins in Canada, James and Sadie. I was never sure of the connection but the information in the letter from Gillian clearly links them as Walters children. Now further to all of this I have an email from Penny Muston in Canada, wife of Walters grandson Stanton Muston. Walter went to Toronto and became a rose grower, he had 4 children, One son Walter Stanton b 1896 (a florist) had a son Stanton Walter b 1927 who married Penny Burgess. Penny and her family have given my lots of information about the Canadian Mustons. Stanton's sister Lois Bowden visited me here in Australia in Feb 2007 and gave me a lot more information about the Canadian family that I will later post to this site. Other children were Sadie and Jim mentioned above, and Evelyn. (not in any order as I do not know their birth dates or marriage details). I now have some postcards from before and during the first war which mention x-mas parcels that Sadie sent to cousin George in France, and also exchanging of photos which gives evidence that the extended family were good communicators..
Just a footnote here is that Stanton was the maiden name of my GGGM Mary, whom I expect Walter would have known therefore it was probably passed down. All of this history and further generations are listed in my Excel spreadsheet and elsewhere on this site. .